Posted on January 5, 2011 by Jill B.
Everyone’s looking to garner some buzz for CES 2011 January 6-9 in Vegas, and this is especially true for contenders in the tablet market. According to an exclusive Fox News report, Palm and HP are looking for a competitive edge when they reveal their new pride and joy, the HP PalmPad tablet. While many may scoff at the brand for even daring to challenge the king tablet, iPad, the rumored features are worth noting. They just might sway some consumers who feel the Apple tablet leaves more to be desired (ahem, USB?). Fox News reports that HP and Palm will display three PalmPad models at CES with webOS 2.5.1. A fourth model, tailored for college students, will be absent from the expo lineup. Weighing in at just over a pound with a more than 9 inch screen, it intends to operate on Sprint’s 4G network. The HP PalmPad also includes front and back cameras with LED flash. It is set to arrive in stores in March. The sketches of the tablet design reveal an especially exciting feature: a USB 3.0 port. The SuperSpeed connection could open up more application possibilities for tablet users. With backward compatibility, this USB tablet will not only allow speedy data transfers but also enable wireless sticks for zones void of WiFi, plug in peripherals like cameras and charge or tether phones. It just might be a solution for some consumers to turn to if they hesitated buying an USB-less iPad for a lack of user options. Apple iPad lovers may argue that a tablet is not intended to be used in such a way or that the USB drivers could clog the efficiency of the operating system. However, consumers don’t like to be told they have to be limited in their digital efforts, and just having the option of a USB port at the very least as opposed to a proprietary connection is appealing. As a big side note, keep in mind that rumors are just rumors, and in the blogosphere, CNET, Engadget, and other sites are quick in their skepticism of an iPad killer, and with good reason. 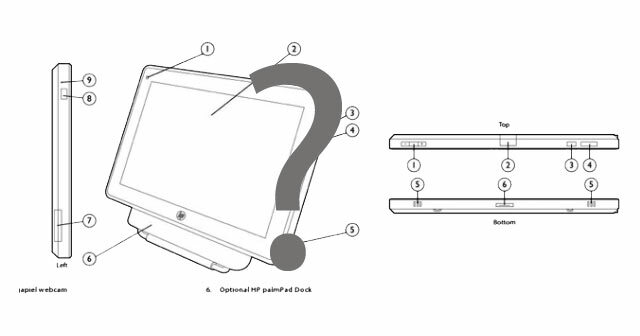 They point out that the exclusive sketch diagram of the USB tablet looks more like HP’s Slate 500 diagram dressed up with a webOS. Fact or fiction, the possibility of a USB equipped tablet could help start a trend followed by other companies, even Apple, who has had a secretive stance on the universal interface when it comes to its latest products. CES 2011 will determine how the tablet’s specs will play out. Do you want the PalmPad rumors to be true or are you holding out for USB on the iPad 2? This entry was posted in Apple, Articles, HP, HP PalmPad, Palm, SuperSpeed USB 3.0, USB 3.0, USB Future, USB Tablet, USB Technology and tagged CES 2011 January 6-9, HP PalmPad, HP PalmPad tablet, HP PalmPad Tablet USB Rumors, HP Slate 500 Tablet PC, PalmPad, USB tablet. Bookmark the permalink. I think that it’s awesome that they’re making a tablet with capability for USB. That’s an important thing for computers, especially those who are touch-incompetent, like me.